A 5 minutes walk brings you to the next underground station (U4, Hietzing), the center can be reached in 15 minutes. The Sch�nbrunn Palace, the Naschmarkt and many other sights are easily and quickly accessible. 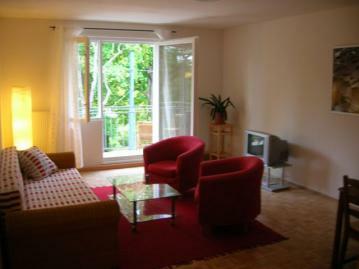 The apartment is newly renovated and offers a cosy ambiance. It includes a well equipped kitchen (dishwasher, microwave oven, washing machine), two bedrooms and a large living room with balcony. All operating costs (heating, electricity, internet access, ...) are included in the monthly rent of Euro 1.380 for a longer stay ( more than 3 months). The apartment is also available for shorter periods! Click on the icon above, to see the shorter stay prices.